Your Next Stamp is having a great contest leading up to our next Blog Hop on December 10 and you can win some of the new releases! Check out the YNS blog for all the details!! Yay! It's time for another La-La's Weekly Wednesday Challenge! This week I'm hosting and I've chosen a 3-2-1 Recipe as my challenge. 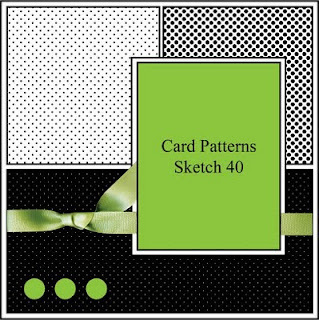 I would like you to use 3 patterned papers, 2 colors of cardstock (white counts as a color), and 1 type of embellishment. Now since opinions can differ as to what is an embellishment, I've made a list of the 'bellies that I think have more visual "weight" and count for purposes of this challenge: ribbon/lace, buttons, gems/pearls/acrylic drops, beads, charms, brads/eyelets, other metal hardware and flowers. So pick one type off the list, but you can use as many of that one type as you like! Anything that's not on the list is ok (such as glitter, liquid applique, punched pieces, Flower Soft, etc.). I hope this isn't too complicated and that you have fun with this challenge! I used Winter Lala and a sketch from Card Patterns. Lala was stamped, colored with Copics, cut out and popped up on foam boosters. All the patterned papers are from the Basic Grey Eskimo Kisses 6x6 paper pad and the cardstock is Bazzill. To finish off the card I added some little gems, a bunch of sewing, and a sentiment from Papertrey Ink. I hope you'll play along with us! All the details can be found on the La-La Land Crafts blog. TFL! Glitter Snowflake Pile It On! I have a Pile It On! card for you today. This week one of our own DT members is our sponsor! Amy Schultz is a Close To My Heart Independent Consultant and has generously donated a prize this week, and also sent out CTMH items to the team to create with! Please check out her blog and see the PIO blog for info about a fabulous promotion she has going right now! That big snowflake in the center is a CTMH rub-on that I accented with Stickles, an extra sprinkle of glitter and some tiny rhinestones. 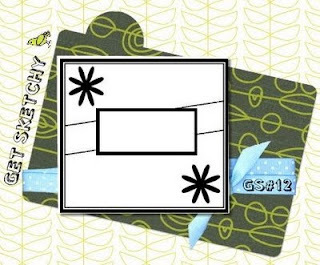 The patterned paper and red cardstock (which I embossed with a Spellbinders snowflake Impressabilities template) are also from CTMH - thanks Amy! To give the card a little more interest, I did a blanket stitch around the edge of the red circle with white crochet thread. It was easy to do and I think it lends a really homey touch to the card. If you're looking for the Your Next Stamp Challenge #4, it's the post directly below this one. Thanks! Wednesday means it's time for another La-La's Weekly Wednesday Challenge! This week our theme was set by none other than our super fabulous and talented Irina and is "We are thankful for you", just in time for Thanksgiving. The challenge is to make a Thank You card or project. 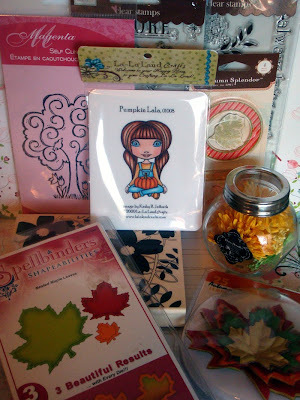 Before I show you my card, I want to let you know that there is blog candy to be won!! To enter into the Blog Candy you just need to participate in the Thankful Challenge. Please also spread the word and mention our Blog Candy on your blogs. The winner will be randomly picked from your entries into the Challenge. I used Sitting Lala and a sketch from Friday Sketchers. I stamped Lala, colored her with Copics (with just a bit of colored pencils around the irises), cut her out and popped her up with foam boosters. I very lightly distressed all the straight edges of the patterned papers and sewed down the 2 green strips. Lastly I added some ribbon, flowers with leaves, and a sentiment. We'd love to have you join us! Please see the La-La Land Crafts blog for all the details! TFL! Other materials used: sentiment (Mega Mixed Messages set) and Dark Chocolate ink - Papertrey Ink ; patterned paper - Pebbles Inc.; vanilla cardstock - Stampin' Up! ; ribbon - My Favorite Things; hydrangea flowers - Prima; roses - Paper Wishes; rectangle and scalloped rectangle Nestabilities. I decided to use Yippee Fhiona because she's so cute and fun! She was stamped, colored with Copics, cut out and popped up on foam boosters. I used the Sketch For You To Try from Jen del Muro. YNS is sponsoring the SFYTT this week and you still have a couple days to enter to win a $10 gift certificate to the store! The sentiment is a Quickutz diecut which I cut out of cardstock a few times, and then once out of patterned paper and glued them all together. I wanted it pretty thick so it would stand out from the PP underneath. For the mat around the Nesties label, I just traced the outside of the same die with a pencil on the back of the PP and cut it out. This week we have a change in the rules for playing along with our challenge - you don't have to use a YNS image, but if you do, you will get an extra entry in the random drawing for the prize of $10 in YNS Bucks! Also, everyone who participates in this challenge will get one of the limited edition Christmas/Winter digis for FREE! If you've already got all of the digis, then you'll get a $3 coupon code to use at the store! So c'mon and play with us!! For full details, please see the YNS Challenge Blog. TFL! Winner of YNS Blog Hop! Hi everybody! Thanks so much for hopping along with the Starlets and all your sweet comments - I appreciate each and every one! I hope you were inspired by our projects! I have the random winner of the 2 Christmas digis today! After going through all the comments and finding the ones that listed their fave new Fhiona set or Christmas digi, I did the random generator thing (sorry, I'm feeling a bit under the weather and didn't have the energy to do a picture of the winning number), and I came up with: Mary of My Scrap Happy Life! Congrats Mary!! Please email Karen: karen(at)yournextstamp(dot)com with your 2 individual digi image choices. Thanks again to everybody for joining us for the hop! Just a little reminder that there will be a new YNS Challenge posted tomorrow and we'd love to have you all play along! ETA: This card was featured on Little Red Wagon! Woohoo! All the squares are 1.5" and the papers are old Basic Grey. 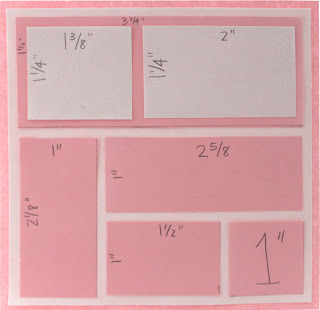 For the little scene squares, I was inspired by this card and other similar cards all by Jessica Knutsen. I couldn't do tone on tone because you'd never see white on white, so I stamped the backgrounds in a light blue ink, and then added the penguins popped up on foam boosters. Each one has some paper pieced clothing all stamped on the same scrap of striped PP. After I distressed and sponged the edges of all the squares, I sewed them to a piece of Kraft cardstock with a combination of straight and zigzag stitches. Next I diecut a piece of chipboard and some glitter cardstock with a Sizzix snowflake die and glued them together. I poked 2 holes in the snowflake and then sewed it with a button to the quilt with crochet thread. I also sewed on all the other buttons with crochet thread. Lastly I sponged the edges of the white base and glued the quilt to it. Before I get to this week's challenge, I have a couple things to share. First, Monday was our Guest DT Katie Tate's birthday! Her creations are totally fabulous and she is a queen of combining challenges, as well as putting on her own challenges at Cooking It Up With Katie, so please check her out and leave her some love! Second, La-La Land Crafts will be at the Stamp in the Hand Show in Carson, CA on November 14-15 at the Stamp On Over booth, so if you're anywhere near there, stop by! Ok, now on to the challenge! Lala was colored with Copics, cut out and popped up with foam boosters. I gave her a snowy hill to stand on by coloring in a hill shape with a really light blue Copic, and then covering the hill with glitter. The snowflake was die cut from glitter cardstock and the final touches were the gems, ribbon and a Making Memories rub-on. The papers are all Basic Grey (Eskimo Kisses collection). Hey everybody! Thanks so much for joining us for another super awesome Your Next Stamp Blog Hop! 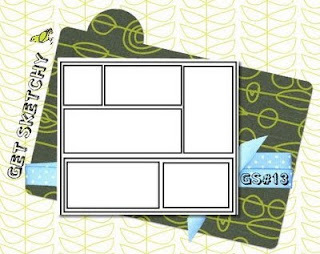 Your Next Stamp has 3 new Fhiona sets (Wedding, Bad Hair Day, and New Year's) plus the Limited Edition Christmas digis that were recently released so the Starlets have whipped up some yummy eye candy for you using the new stamps! You've reached the last stop on the hop! If you didn't come here from Stephanie's blog, you'll definitely want to go back and start at the beginning of the hop: If you comment at every stop on the hop, you'll be entered to win one of the brand new Fhiona sets (3 winners in all)! Also, Karen is looking for a name for Fhiona's best buddy/hubby, so anyone who posts a name suggestion on Karen's blog will get an extra entry into the Wedding Fhiona giveaway! Lastly, each blog will be giving away 2 of the new Christmas digis to a random commenter! For your chance here at my blog, please leave a comment letting me know which of the new Fhionas or Christmas digis is your fave! The deadline for commenting for the giveaways is midnight EST, November 16 and all winners will be posted on Karen's blog on November 17. I will also be posting my digi winner here on my blog. One last thing to mention before I get to my projects: Karen is offering 10% off all week, plus there will be a surprise gift in every order! The coupon code is YNSBH2. For my first project, I used Bad Hair Day Fhiona as she was meant to be used. I paired her with some really old Rob and Bob paper and used a sketch from Unscripted Sketches. She was colored with Copics and her brush was cut out and extra bristles popped up for dimension. I did a bunch of sewing and added the sentiment all cut up (I really love the look of this and have done it a bunch with my YNS cards). This time I watercolored her and flocked the collar and cuffs of her robe. I used a sketch from Sketchy Thursday and some yummy papers from Basic Grey's Eskimo Kisses paper pad. This card also qualifies for Lili of the Valley - 3 papers, 2 stamps, 1 type of embellishment, Secret Crafter and Crazy 4 Challenges - both easel cards. 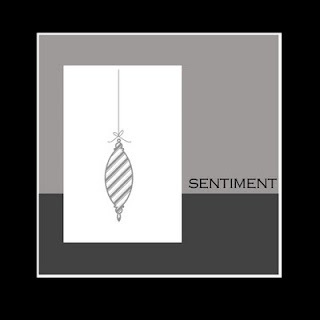 Lastly, the sentiment is from Papertrey Ink. My final project came from the lastest Splitcoast newsletter. Beate had a great tutorial for a luminaria that I thought would go perfectly with the new Christmas digis! Before I go, I want to remind you that there's still time to play in the YNS Challenge #3 - make a Christmas project without the colors red and green! Whew! That’s all for now! I hope you enjoyed my projects and thanks so much for joining us on the hop! You can get the .cut file here and here's Beate's tutorial which tells you where to score. If you like the .cut file, please leave me a comment and let me know. Also, I'd love to see any projects you make with my file! Thanks very much to Beate for such a fun project!! It really helps me to not waste patterned papers by cutting them in the wrong sizes (except in this case where I tried about 3 different papers before settling on the blue one!). This card was pretty simple (once I figured out my pattern). I paper pieced the tree, grass and bird, and distressed all the edges of the sketch pieces. All the paper is from the Nutmeg Mini Deck from Cosmo Cricket. Lastly, I added some cross stitches with crochet thread for a little interest. Finished card size is 4.25" square. I hope you like it and TFL! If you're looking for the Your Next Stamp Challenge #3, it's the post directly below this one. Thanks! It's Wednesday so I have another La-La's Weekly Wednesday Challenge for you! This week our theme was set by Kim and is "Pink" - it doesn't have to be all pink, just mostly pink. As soon as I saw this challenge, I knew I wanted to make a pink Santa Lala card! I've been seeing easel cards everywhere and really love the look so I decided to try one! I stamped Lala twice on plain cardstock and once on the polka dot paper. On the first cardstock version, I colored her face, hair, neck and legs with Copics. On the second version I colored her hands and belt with Copics, then I cut out the hands with trim attached, all the other trim pieces of her dress and hat, and the belt. I cut out the hat, dress and shoes from the polka dot paper. Then I just layered them as you see here. I added a few bits of scrap cardstock under her hat for a little dimension and I flocked all the trim pieces. This qualifies for the Stamp Something challenge - cute and fuzzy. Lala is super cute and all the trim on her outfit is fuzzy! The Bonus Challenge is to use spray ink so I sprayed the flowers with Pearl Glimmer Mist for sparkle. For the inside, I cut and border punched a strip of cardstock, glued a thinner strip of patterned paper to the top of it, and scrap strips to the bottom (for extra height) to act as the stopper. Lastly I embellished the card with snowflakes punched from glitter cardstock, Prima flowers, punched branches, buttons with silver cord, and a rub-on sentiment from Basic Grey. Daring Cardmakers wants to see our newest punch and that would be my McGill Pine Branch punch. We'd love to have you join us! All the details can be found on the La-La Land Crafts Blog. TFL! I colored the image and clear rhinestones with my Copics, added Stickles to all the little dots, and some Stardust glitter pen all over and around the star. I also sponged Distress Ink around the edges of the main panel and sentiment strip. The scalloped strip in the middle is the very bottom of the 12x12" sheet of patterned paper where the manufacturer's name is listed! It was too pretty to just throw away! The parts without the name weren't long enough to go across the whole card, so I just cut it up and hid the gap under the main panel. This qualifies for the My Time To Craft challenge - "So Many Scallops." We'd love to have you join us - the only rule is that you must use a Your Next Stamp image. If you don't have any Christmas images from YNS yet, you can get some (or all!) of the Christmas digis from the store now to play in the challenge! All the details for the challenge can be found on the YNS Challenge blog. BTW - have you heard of Uhu products? I got their October Sample-of-the-Month, the permanent glue roller, for free in exchange for using it and posting my honest review! Because it's made up of micro dots of glue instead of a continuous "strip" of adhesive, you don't have to worry about how to end each line of adhesive that you put down. I used it for my card today and found it very easy to use. It holds pretty well for the most part, but the main panel wouldn't stick to the glittered patterned paper so I ended up using a little bit of glue. Also, I'm not sure what "permanent" means because 1 day after putting the card together I can still cleanly pull apart the layers. Hopefully the bond will get stronger as time goes on. Thanks to Uhu for the sample! TFL!